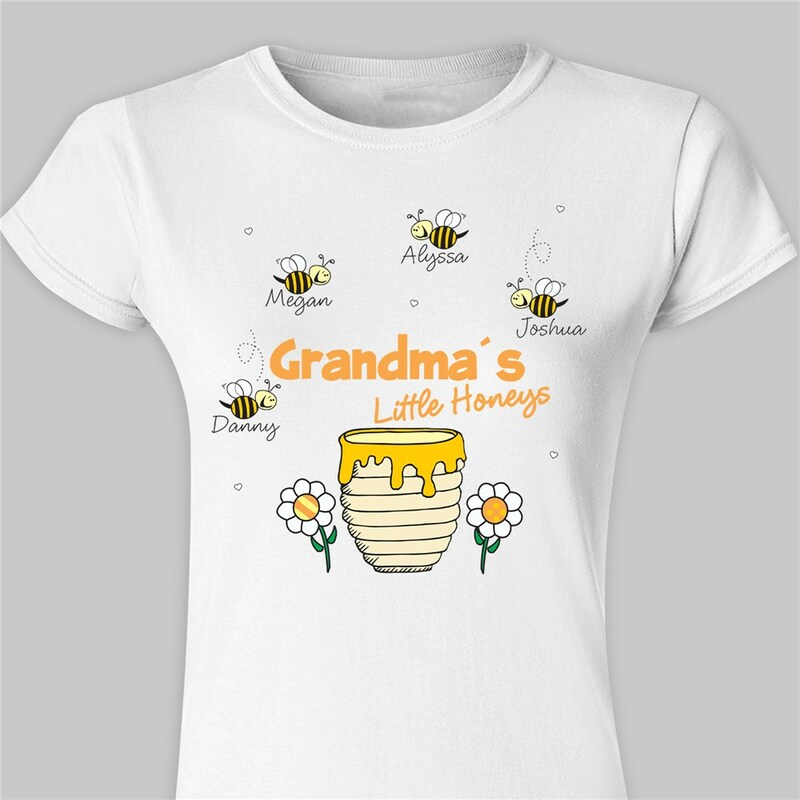 Mom, Grandma, Aunt & Nana will love showing off their sweet little honey bees on their very own Personalized Womens Fitted T-shirt. A custom printed women's t-shirt makes a perfect gift for Mother's Day, Grandparents Day, Sweetest Day or her upcoming Birthday. 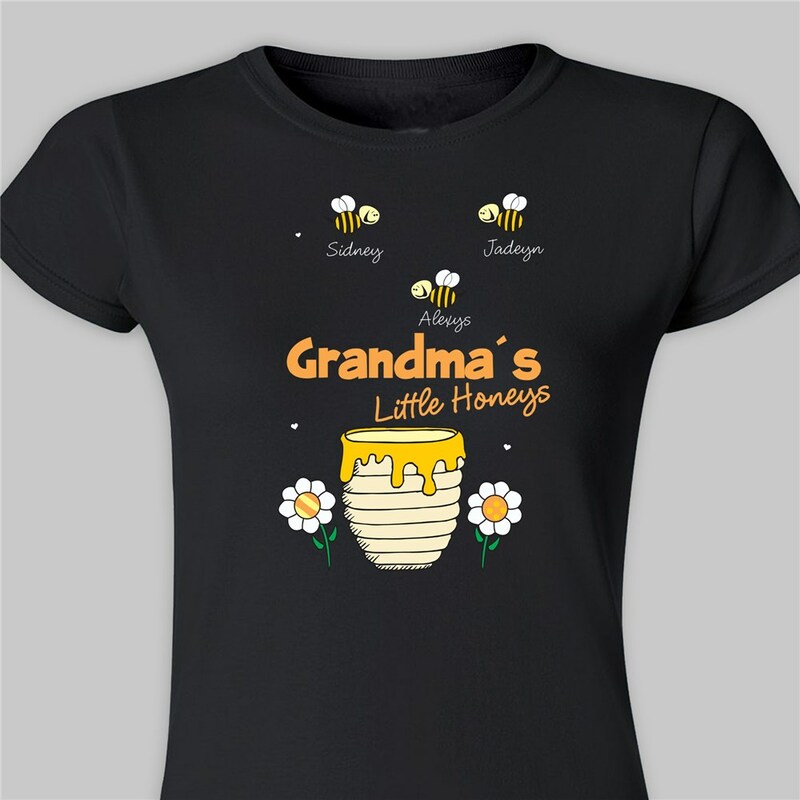 Our Little Honeys design is available on our premium 100% soft-style cotton Personalized women's T-Shirt, machine washable in adult sizes S-2XL. Please Note: 3XL available in black and white only. Shirt is 4.5 oz , pre-shrunk, double-needle stitched sleeve and bottom hemmed. Includes FREE Personalization. Personalize your Mother's Day T-shirt with any title & up to 30 names. I bought this shirt for my daughter-in-law. It is super cute and good quality. My daughter-in-law loves it so much, she jokingly said she is going to wear it every day! they saying and the shirt was cute my neice loved it and I did to. GiftsForYouNow.com offers many great Personalized Gifts for Mother’s Day that your Mother or Grandmother will cherish for years to come. We have an extensive collection of Personalized Mother’s Day Picture Frames, Personalized Mother’s Day Shirts & Personalized Keepsakes. Place your favorite Poem onto one of our Personalized Mother’s Day Poetry Gifts or place your favorite Photo onto our wonderful Personalized Photo Gifts.